Development of an all-electric version of the Van Hool CX series coaches in partnership with Proterra, a leader in the design and manufacture of zero-emission heavy-duty vehicles is underway. 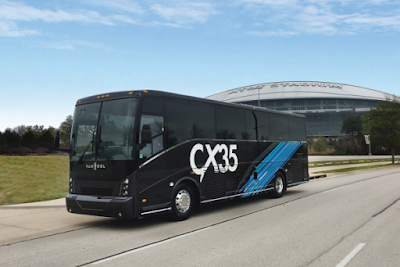 The new Van Hool CX45E and CX35E models utilize the CX platform and will feature Proterra E2 battery technology along with a fully-electric drivetrain designed to deliver exceptional operational, environmental and passenger benefits. The CX Electric Vehicle partnership will bring together the resources of — ABC Companies, Van Hool, and Proterra — each committed to technology innovation. The vehicle will be designed and developed at Van Hool’s Belgium-based operation, and the first prototypes will be built there as well. Currently the diesel-powered CX45 and 35 models are fabricated in Skopje, Macedonia, and in the near term the production of the CX45E will take place at that site. Ultimately, upon completion of Van Hool’s U.S.-based production facility, orders for the electric model will be fulfilled on U.S. soil to meet Buy America compliance. The partners are responding to the demand for a truly zero-emission solution that can improve environmental quality and reduce operating costs, while continuing to deliver all the performance, reliability and safety the Van Hool CX Series product line is known. The decision to offer a fully-electric product is a direct reflection of changing market needs driven by clean-energy initiatives, sustainable transportation solutions and green-technology consumer preferences and desires nationwide. Both CX Series models will be offered with Proterra E2 battery technology. Operators nationwide utilize the CX45 and CX35 models in a variety of applications including large Silicon-valley employee-sponsored shuttles and commuter operations in major metro regions throughout the country. Featuring Proterra’s advanced electric vehicle technology, the Van Hool CX45E is designed to be the most efficient and highest performing long-range eCoach offered in the U.S. market, which eliminates hundreds of thousands of pounds of greenhouse gas emissions per year. Outside dimensions are the same as current CX diesel models. Operators will be able to test drive an electric CX45E coach at the Van Hool factory in late 2018, with deliveries beginning in 2019. The CX35E coach model will be introduced shortly thereafter. All of the partners anticipate strong demand for the new product, according to the company. ABC will begin taking orders in 2018.